Prime Minister Lee Hsien Loong and Datuk Seri Anwar Ibrahim at the Prime Minister's office, on Sept 15, 2018. SINGAPORE - Malaysian politician Anwar Ibrahim said on Saturday (Sept 15) that Singapore will be one of the first countries he visits when he becomes Prime Minister, stressing that the two countries need to forge strong bonds. 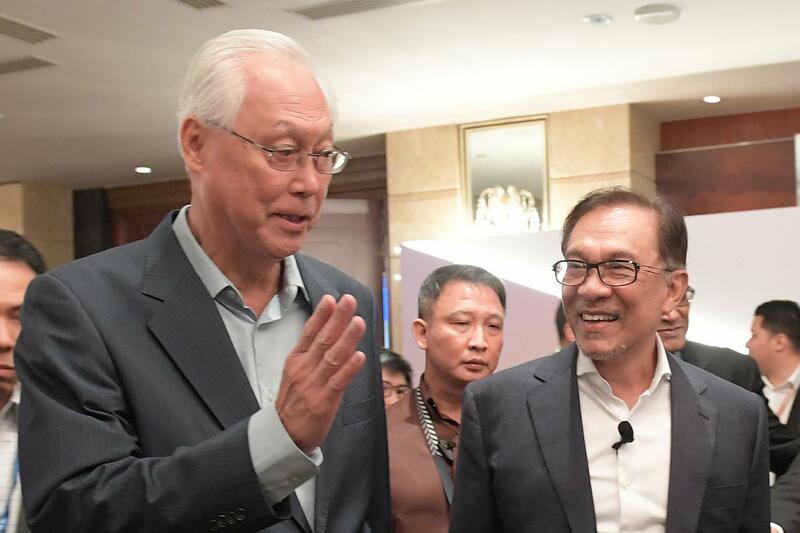 The de facto leader of the ruling Pakatan Harapan (PH) coalition was asked to comment on bilateral relations between the neighbouring nations at a conference here. "Singapore-Malaysia relations ... ada problem ke? (is there a problem)," he remarked, drawing laughter from hundreds of business and thought leaders gathered to hear him speak at the Singapore Summit 2018. Datuk Seri Anwar, who was released from prison in May after receiving a royal pardon from Malaysia's King, is set to succeed Prime Minister Mahathir Mohamad in two years, as agreed by the PH leadership ahead of May's general elections. On Wednesday, Mr Anwar's Parti Keadilan Rakyat announced he would contest in a by-election in Port Dickson, paving the way for him to become an elected MP and return to Parliament. "If and when I assume the premiership, then I will make sure that one of the first countries I visit will be Singapore," he declared at the dialogue session on Saturday. In the four months since PH's historic win at the ballot box, Malaysia has deferred the Singapore-Kuala Lumpur High Speed Rail project and raised the prickly issue of how much it charges to supply water to Singapore, indicating the price should be raised ten-fold. Mr Anwar noted on Saturday that it was not sensible to create problems between the two countries. He said that while Tun Dr Mahathir was firm on some of these contracts, "it was confined to that particular problem and we try to resolve it on a bilateral basis, proceed with negotiations ...". In his first public appearance in Singapore since his release from jail, the seasoned statesman played to the crowd with his trademark mix of fiery rhetoric, literary quotes and jokey asides. He even apologised for stumbling over some words in his speech, explaining: "In prison I only spoke Malay." He recalled that on one of his visits to Singapore - before he was sacked as Deputy Prime Minister by Dr Mahathir in 1998 - he told Singapore's Emeritus Senior Minister Goh Chok Tong, who was then PM, that Singaporean leaders were too serious. "You know, Singapore and Singapore leaders are too serious and business-like. We (Malaysians) tend to, you know, cultural sikit (a little) ... relax sikit, give and take sikit. Singapore - (it's) dollars and cents," he said. A month later, he said ESM Goh invited him to an opera performance by renowned tenor Luciano Pavarotti. "He took my words seriously," Mr Anwar exclaimed, as Mr Goh, who was in the audience, laughed along. Mr Anwar also stressed that relations between Singapore and Malaysia have been historically strong but warned that the younger generation from both countries might not share the same experiences and relationships as the first or second generation citizens. "You need to understand that and therefore we need additional effort," he said. He singled out, as an example, Prime Minister Lee Hsien Loong's visit to Putrajaya soon after PH won the election. "It was very cordial and it was a very (good) gesture for the PM to be the first to come and visit," he said. "I think these signals are important because this goes beyond just diplomatic encounters or business deals."